First: what is a leek? Leeks are relatives of garlic and onions. (As if vegetables had relatives, right?) 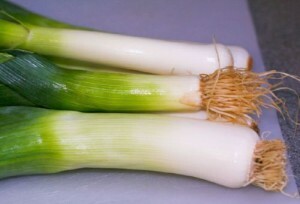 Leeks are positively delicious additions to soups or salads and can also be eaten alone as a side dish. Here’s a brief explanation of the tastiest way I know how to cook leeks. Place washed and trimmed leeks in a single layer in a baking dish. Dissolve stock into 1/2 cup red wine and ½ cup cream. Pour the liquid over the leeks and add water until the liquid is about half way up the sides of the leeks. Dot with butter and season to taste with salt, pepper, and granulated garlic. Boil on top of the stove and cover. Braise in a preheated oven at 350 degrees with the cover ajar for 30 to 40 minutes. Sprinkle minced fresh parsley on top and serve. Leeks provide a good source of fiber, folic acid, vitamins B6 and C, manganese, and iron. They can be used in place of onions for common recipes for a slight flavor change. Reported to help lose weight, they can just be soaked in salt water and eaten raw if desired.